You can log in (and out) using the main menu (under ‘The Directory’) (see fig 2). 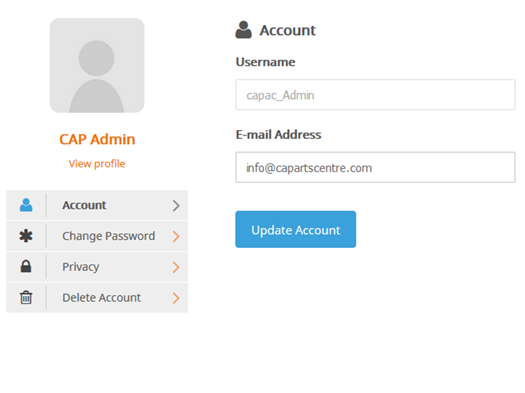 You can edit your account (change email address, delete the account) using the ‘My account’ link in the main menu (see fig 2). You can change your password, hide your profile from view or delete your account. There is also a link to ‘view profile’. Once logged in, you can edit your profile by going to it in the Directory and clicking ‘Edit Profile’ or by clicking on the profile image and clicking the cog symbol – – on the right hand side under the cover photo (the landscape image). Please note: The cog symbol becomes a tick symbol when editing and has the same function as the ‘Update Profile’ button at the bottom of the editing page. CAP respects your private information but the Directory is accessible to the public so please do not include any private information (eg: telephone number) that you do not wish to be publicly available.